These rooms will enable you to enjoy your holiday in the height of comfort, with the complementary services and facilities of the exclusive The Level floor. Enjoy unbeatable views of the sea, in an area of 43 m² consisting of a hall, bathroom with double shower, bedroom with mini lounge and balcony. Located on levels 4-9, they are ideal for families with children. À la carte snack service (breakfast, lunch and dinner)* (VIP bar lounge). The classic rooms boast beautiful views of the pool areas and gardens in a warmly designed setting. They are spacious, with an area of 43 m² including a hall, bathroom with bathtub and double shower, bedroom with king size bed or doubles, sofabed and balcony. Located on levels 2-9. 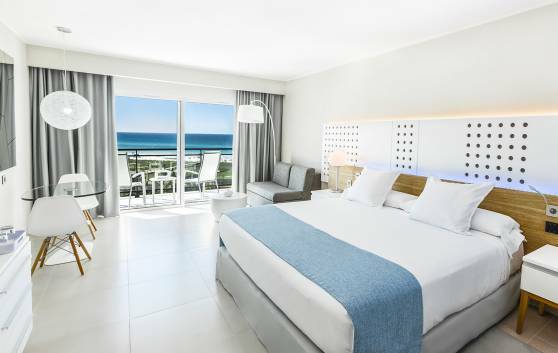 The stunning beach views are one of the benefits of these spacious and welcoming rooms, enabling you to enjoy your holiday in Varadero to the full. In an area of 43 m² they include a hall, bathroom with bathtub and double shower, bedroom with king size bed or doubles, sofabed and balcony. Located on levels 3-9. Our Junior Suites are spacious and welcoming. Definitely an ideal option for enjoying the wonderful view of Varadero beach. With an area of 47 m² they include a hall, bathroom with double shower, bedroom with mini lounge, king size bed or doubles, sofabed and balcony. Located on levels 3-9. 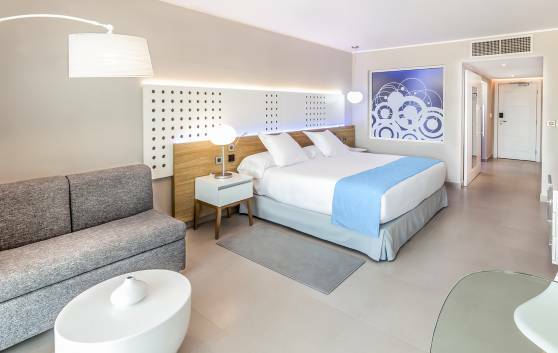 Enjoy the superior comfort and the additional services of the exclusive The Level area in these Premium rooms, renowned for their privacy and personalised service. The balcony offers beautiful sea views, whilst the spacious area of 43 m² includes a hall, bathroom with double shower, bedroom with bathtub and balcony. They are located on levels 4-9 and are ideal for families with children. 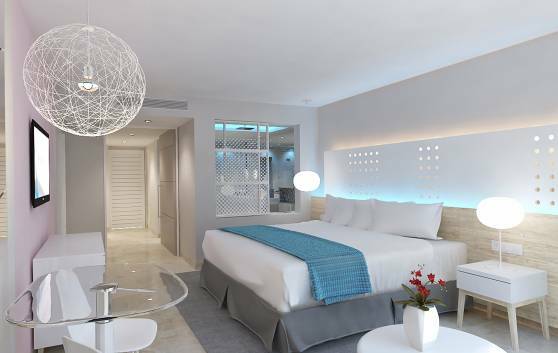 Enjoy the avant-garde design and spacious area that makes our Junior Suites a highly attractive option in the exclusive The Level Adults Only area. In addition to the complementary and personalised services, you can enjoy the beautiful sea views. 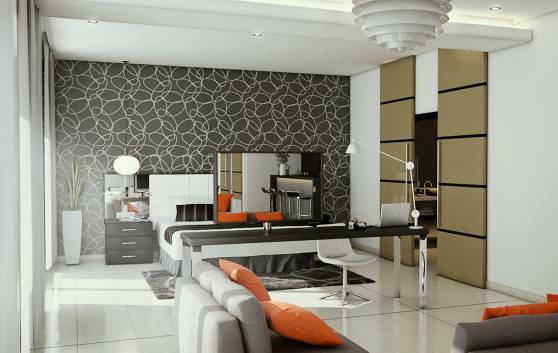 In an area of 47 m² the suites include a hall, bathroom with double shower, bedroom with bathtub, mini lounge and balcony. Located on levels 2-6. 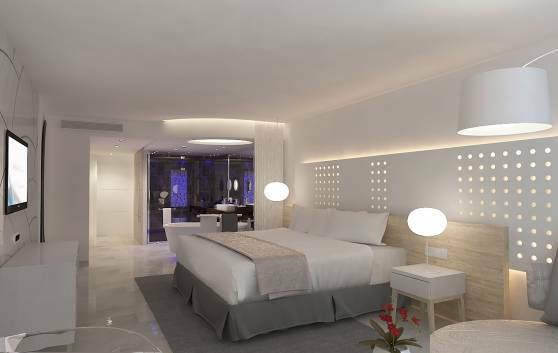 Spaciousness and maximum comfort are the hallmark of the highly exclusive Grand Suite in our The Level area. An unrivalled view of the beach is just one of the many additional benefits that make this space so special, where excellence can be seen in every detail. Make full use of the special and highly personalised The Level services in an area of 88 m² which includes a hall, lounge-dining room with sink, hall-lounge with TV, double sofabed and bathroom with shower, as well as a bedroom with bathtub, TV and bathroom with double shower, balcony and lounge. Located on levels 7-9. 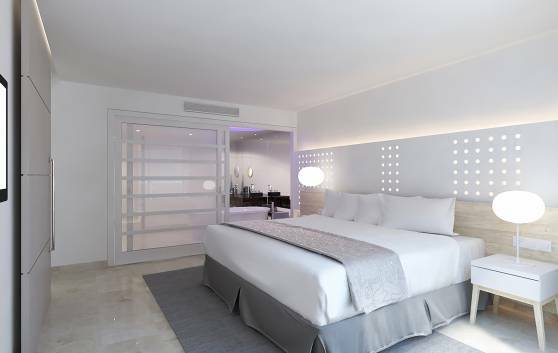 The Royal Suites on our The Level Adults Only floor offer you beautiful views of Varadero beach, with this area's exclusive and highly personalised services. These rooms include a modern, spacious area of 96 m² consisting of a hall, lounge-dining room with sink, hall-lounge with TV, double sofabed and bathroom with shower, as well as a bedroom with bathtub, TV, dressing closet and bathroom with double shower, balcony and lounge. Located on levels 5-6. The Penthouse Suite is the ultimate in comfort in the exclusive The Level Adults Only area. 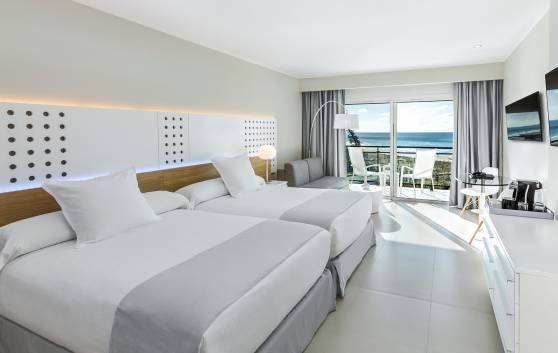 The unrivalled view of Varadero beach and its total area of 433 m² offer you a wonderful stay in a very private and tastefully designed space. Consisting of a hall-lounge with bathroom, lounge-dining room with bar and kitchen with fridge, electric oven and dishwasher. It has two bedrooms, each with TV, ceiling fan, dressing closet, bathrooms with double shower and bathtub. Its terraces are equipped with sofas, Balinese beds, loungers, sauna, Jacuzzi, outdoor shower, grill, breakfast table and solarium. Located on level 7 of the hotel.